I mentioned in my last blog about the removal of class 6 from the Severn Marque. I met the Marque manager at the show – I have found out that class 1 and class 6 have been combined (which i had already discovered) but that the size of stand can now be either the size of the original class 1 or the size of class 6. Not quite sure how they can be judged against eachother fairly when they are two different sizes. There will be much more work involved in the larger stand, both setting up and growing the plants ready for the show. Seems to me they are just trying to save some money, they obviously want the same number of entries, but by combining them they will only have to pay out one set of prize money. Every year i have been to the show as an exhibitor there has been an exhibitors tent where food and refreshments have been sold – this year i looked and looked for it, but couldn’t find it, I spotted someone that looked like they would know, and asked, I was told that they only made £300 there last year so they had dropped it this year. I was stunned, i didn’t say anything as i was so surprised, but surely they should have continued with the exhibitors tent if was was making money – £300 is surely not a bad thing. I’m thinking they are getting far too greedy at the Flower Show. I went out of the showground at lunch time as i wanted to be able to have a sit down and a rest, which is difficult if getting food from the trailers around the showground. The Quarry Marque, the profesional marque for experts and nurseries / business has also shrunk. There was one marque this year, whereas there has always been at least 2 leading off eachother in the past. 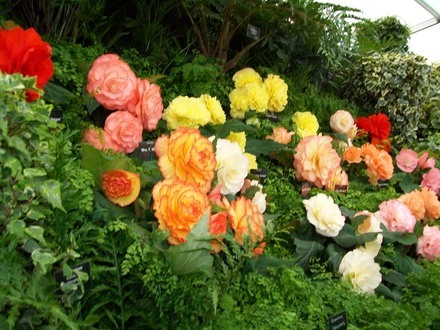 These are pictures from The Shrewsbury flower show 2009, The display stands of Dibleys nurseries (Foliage Begonias, and Streptocarpus) and Fibrex nurseries (Double Tuberous Begonias, and some othert foliage plants). Both of these were missing from this show this year. 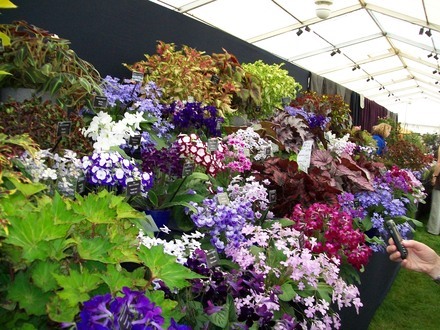 This is a picture from Tatton Park this year (2010) of Blackmore & Langdons display stand. Blackmore & Langdon used to display at Shrewsbury, quite a few years ago now though. All the best nurseries are gradually disapearing from The Shrewsbury Show. I wonder how many more will not be there next year, and how much smaller the show will be? Previous post: email from Shrewsbury show! My husband is involved in another hobby and we travel all over the UK to support shows held in various venues. Over the past 2 years we have seen many of them disappear from the calendar or become so small and insignificant that they are not worth the entry fee. The organisers do not seem to appreciate that on top of the entry fee, visitors also have to pay for travel, which has doubled in price over that period, and accomodation. Exhibitors are also faced with mounting costs and have to compete with added competition from the internet and especially ebay. They have been forced to withdraw from the events because often they do not even make enough to cover the cost of getting to the venue. Organisers are faced with escalating costs because the venues have seen rises in their overheads, which must be passed to event organisers. Insurance, gas and electricity and water have all gone up in price. Add the cost involved in the new legislation eg WI and church coffee mornings used to do great business, nowadays people can't sell homemade food without the fear of being sued. In chasing the dream of having it all we are fast destroying any hope of a return to what we had even 10 years ago. We have been so focussed on me me me that we are ignoring what was good in the past. We can only hope that the principle of swings and roundabouts prevails and we can see these shows revive at some time in the future. Many of the organisers in the past gave freely of their time for their show but the volunteer enthusiast has been disappearing fast as age has overtaken former members and younger exhibitors have more personal commitments outwith their hobby. I think we see a revival of interest in gardening especially with a demand for allotments so it will take time to breed a new generation of committed enthusiasts. Where there is life there is hope. It does seem to be a strange decision to ignore a profit of £300 but if volunteers were required to make the committment to provide the service on the day perhaps they did not have enough bodies to continue to provide it. They probably made more from allowing dedicated vans onto the show ground. The refreshment in the exhibitors tent were provided by a catering company - as they are in the members tent, which is still there, they wouldn't want to upset the toffs in the members tent. The feeling i get, and i have heard other exhibitors saying similar, is that the organisers don't know much about growing plants, and have no idea how much work is involved with growing the plants for the show and also in actually displaying them at the show. As a result they do not appreciate the exhibitors and the work and time they put in, they seem to give the imprssion that they are doing the exhibitor a favour by letting them display the exhibits in their show - wheras in reality the exhibitor is helping the show organisers by displaying their plants / exhibits. Without the plants/flowers/exhibits there would not be a flower show. The entry fee has gone up for both the exhibitor and the visitor a few times since i first started - the prize money has never changed. The prize money far from covers any cost incurred by the exhibitor. The Shrewsbury Flower show is, as i understand, a floral committee, which i have been told is posh people with no idea of gardening (of course, i may have been misinformed) - not as with the smaller shows that i have entered where the organisers are people from the community, spend time at the show and see the exhibitors setting up, often they have entered shows themselves and know what is involved. 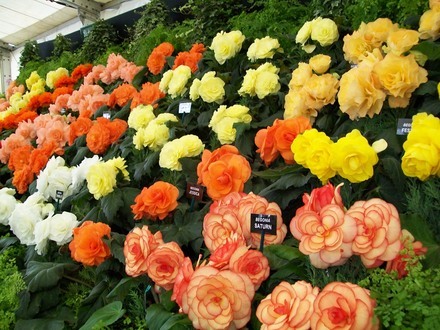 The Shrewsbury Flower Show is linked to The Shropshire Horticultural Society, which is a big organisation. It contributes to some of the smaller local shows - I think the horticultural society itself is a good organisation, as it helps the smaller shows. The Shrewsbury is a large show and sells tickets for about £20 - The smaller shows, i do appreciate may struggle to make ends meet, and i would not expect to have prize money to cover costs (usually only a pound or two) - they are done purely for the enjoyment of showing. Whereas The Shrewsbury Show is much bigger, and if showing many plants transport cost are also added (hiring a van) as everything has to be taken away in one go quickly before the fireworks start, which greatly adds to the cost. As the Shrewsbury is so much bigger, and they do make profit, if the shropshire star newspaper is to be believed, i would expect to have prize monies increased from time to time - and whilst i don't expect the prize money to cover all costs, it would be of a huge help to exhibitors if the prize money were to make a better contribution to the costs incurred by the exhibitor. Anyone expecting to cover all costs would not be showing, all shows are done for the enjoyment of showing. But the greed of the organisers in putting up prices for all, and never increasing the prize money, was confirmed this year when i spoke to a toff in a suit who let slip that the exhibitors tent made a profit of £300. They should still provide that as long as it didn't make a loss. The exhibitors work hard at the show, some put up big displays. When people are on their feet all day for the two days, with the job of taking down the displays in a hurry - you would expect the consideration of somewhere to sit down at mealtimes. Many exhibitors come from a long way off and have to stay overnight (maybe some use hotels, but many stay in caravans at one side of the showground).